This is a step by step guide to using the Loss of the Night app for Android (v2.1.7). If anything is unclear, let me know in the comments and I will revise the instructions. Android phone running at least Android 2.1, but preferably Android 4 or higher. The phone must have a compass and GPS. A location with a light polluted sky. A friend to accompany you while you are doing observations. The ability to see at both near and far distances without removing glasses. Your phone case must not have a magnetic clasp. The Loss of the Night app is meant to be used outside at night. For safety's sake, inspect the area where you plan to do your observation during the day, and make sure that it has level ground where you can move around safety. People using mobile phones are less aware of their surroundings, so you should never use the app alone outdoors at night! Always take a friend to watch out for potential hazards while you are using the app. These could include tripping hazards, vehicles, dangerous weather, and crime. If for some reason it's not safe to do an observation, turn off the app and leave the area immediately! When you first open the app it will display the privacy policies and terms and conditions. To go further, you will need to read the conditions and then click "accept" at the bottom right hand of your screen. When you click "accept" you are brought to a screen with information about light pollution. Click "next" to go on. Next comes a screen titled "USE". We would appreciate it if you would register and tell us something about your vision and your observing experience. Click "Register Now" or just "Continue as a guest". If you choose to register, you will be asked to indicate your approximate age (use the up and down arrows to change), and you can click the buttons to tell us whether you wear glasses and how much stargazing experience you have. We also ask you to provide a username and your email. If you provide your email, we will send you a thank you email within about a month of your observation. In extremely rare cases we contact a user if we have questions about their data. Click "save" when you have entered your data. After you save your data, you'll come to the main menu. To make an observation, click "start observing stars". At this point, the app will only work properly if you're outside, as it needs to get a GPS signal. This can sometimes take up to a few minutes. If it takes longer than that, try using an app like "GPS Status" to check if your phone's GPS is working. Some phones have a problem that prevents the app from getting your position from GPS. In this case, try putting your phone in airplane mode and starting the app again. We are working to understand and fix the problem, but this provides a temporary fix for some Android devices. Next, you are asked to input the current weather conditions. Click the relevant symbol (or symbols), and then "Continue". 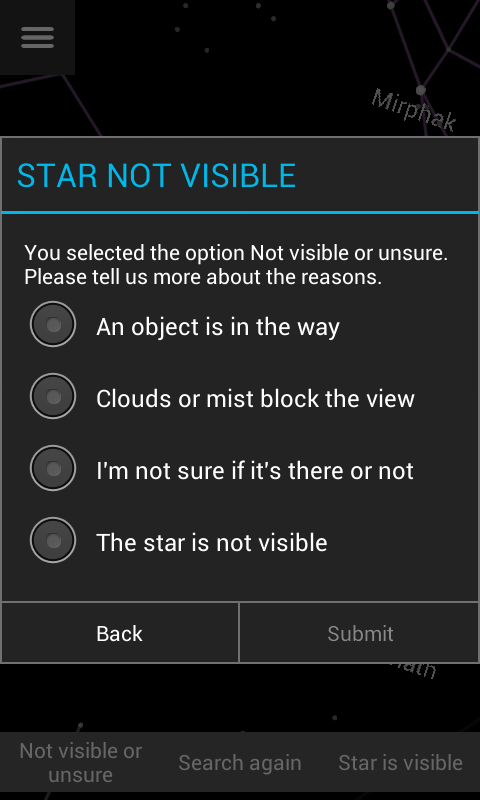 The app will now try to direct you to one of the brightest stars in the sky. Turn your body in a circle and watch how the arrow changes direction. Tilt your arm down so that your app is pointed toward the ground, and it will show you the stars that are under the Earth. Tilt your arm up to the sky, and it should show you the stars that are currently in the sky. It is very important that while looking at the stars in the sky you keep the phone's screen oriented perpendicular to your body! Now search for the star the app is asking you to look for. Turn your body until the arrow points straight up, and then raise your arm until you see a star with a flashing crosshair on it. When you find the star, the circle will expand to fill most of the screen and three buttons will appear at the bottom of the screen. 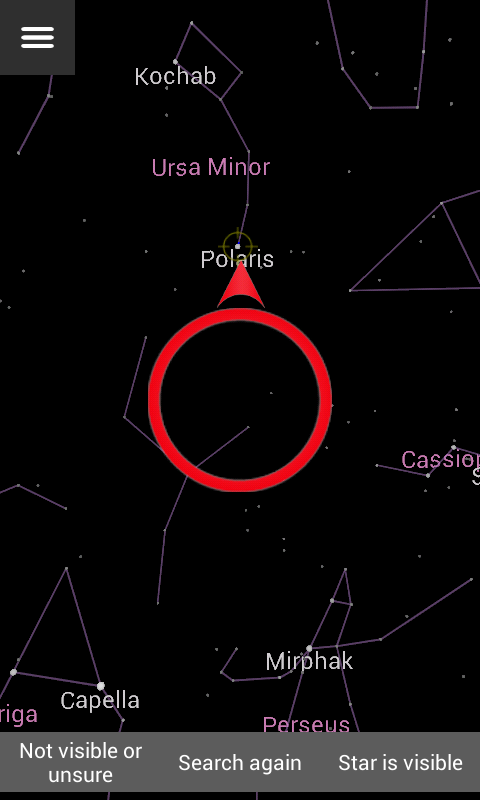 Your job is to decide whether the star the app pointed you to is visible to your naked eye or not. If you can see the star, then click "Star is visible" on the bottom right. 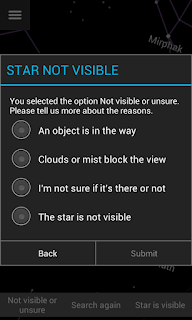 The app will then ask if it's "clearly visible" (very obvious and easy to see), "barely visible" (you can see it while looking at it directly, but just barely), or "visible only with averted vision" (you can see the star only when you don't look directly at it). If you cannot see the very first star, there may be something wrong with your phone. The app always starts with one of the very brightest stars in the sky, which should be visible even inside of large cities. The most likely problem is that your compass is not working properly. If your phone is in a carrying case that has a magnetic clasp, you will need to take the phone out of its case and then recalibrate the compass (quit the app, and then start it again). If the stars appear to be bouncing around a lot, you may be in a location with strong electromagnetic fields (e.g. near overhead or buried power lines). It's best to try to use the app in a grassy area, like a park. On some Android devices, quitting the app and then starting a star search again results in a smoother response. Finally, it's possible that the compass or GPS from your phone is not working properly, and if this is the case the app will not work on your phone. If you're not sure which star we're asking for, or if for some reason you find it too hard to tell whether the star is there or not, choose "I'm not sure if it's there or not". Once you have made a decision on a total of 8 stars, the app will pop up a message that says "8 stars reached". You will have the option to quit, "Register" (if you haven't done so already), or "3 more stars". We would really appreciate it when you observe a few additional stars, because observing more stars improves the accuracy of your measurement. If you click "3 more stars" the app will ask you again when you reach 11, 14, and 17 stars. After that, if you want to continue, it won't interrupt you anymore, and you can click the "back" button whenever you are ready to end your observation. When you end your observation, the data is automatically sent to a server hosted by the GLOBE at Night project if your phone has an Internet connection. If you have a data plan, this should happen immediately, otherwise, it will be transferred the next time you have a WiFi connection. 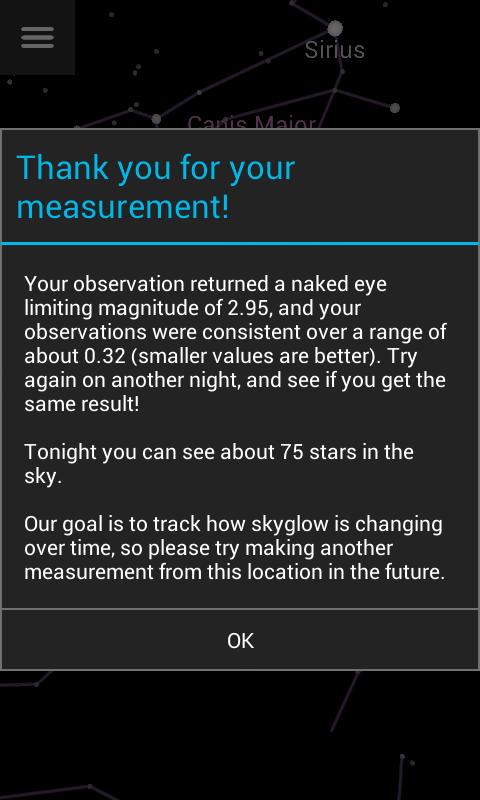 When you finish your measurement, the app will let you know how faint the faintest visible star in your sky is (naked eye limiting magnitude), and approximately how many stars are visible in your sky. For reference, in places without light pollution, it's possible to see many thousands of stars. The app will also let you know how consistent your measurements were. The more you use the app, the better you will get at making accurate, consistent observations! You can view all data collected by participants via the My Sky at Night website. Click the blue bar at upper right to select which years and data sources you would like to observe. An overview of the My Sky at Night website is available here. The "User data" menu allows you to change some of the app settings. 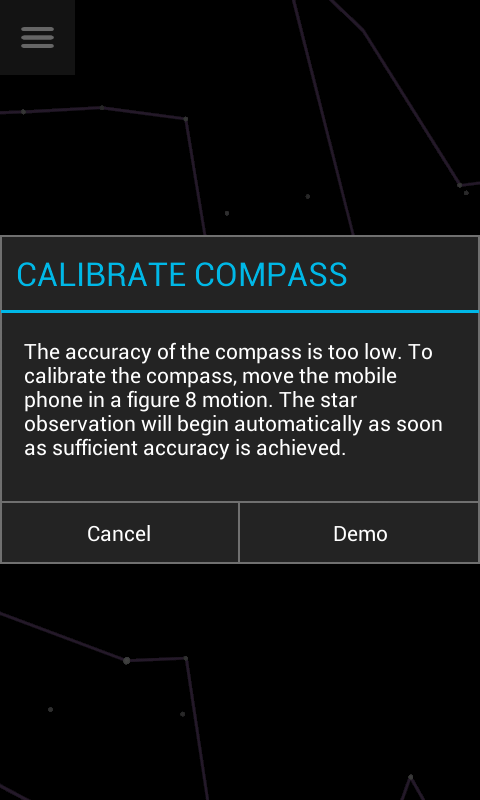 You can toggle the display of star and constellation names, and choose whether some screens display on start up. You can also increase the size of stars and fonts (this might help if you are farsighted). If you find that the screen is too bright during your star observations, click "Make screen darker" and see if it helps. As the year goes on, different stars appear in the night sky over your head. 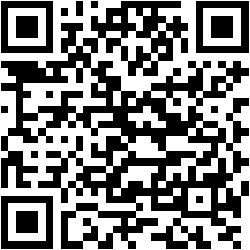 If you enjoy using the app, feel free to use it as often as you like! The app contains a lot of information about light pollution that you might find interesting. You can access this information by clicking on "Project information" in the main menu. You can also switch between "Day mode" and "Night mode" in the main menu. Please use the Night mode when making observations, because it is designed to have less of an effect on your night vision. If you have a Sky Quality Meter, you can submit data taken with the device as well. From the main menu, click "Submit data from SQM" and then use the scroll wheels to enter the SQM value. More information about the Loss of the Night app project is available on our blog. If you'd like to read a paper that demonstrates the scientific value of citizen observations of naked eye star visibility, you can access it for free here. The app is available in 15 languages, and automatically uses the language that your device is set to. Thank you for taking part in this project! Your data will help us understand how the brightness of the night sky is changing around the world. Because we are interested in understanding long-term changes, the most valuable data are observations taken at the same place year after year.